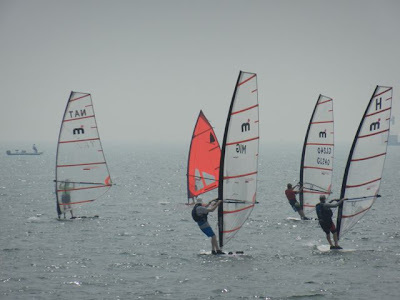 This was the first in a series of summer regattas being held on Original Windsurfers. 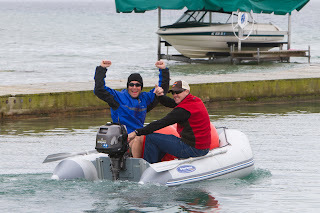 Morning rain, cool weather and water temperatures brought a few brave souls out on Saturday, June 11th. Six sailors showed up and three sailors raced. 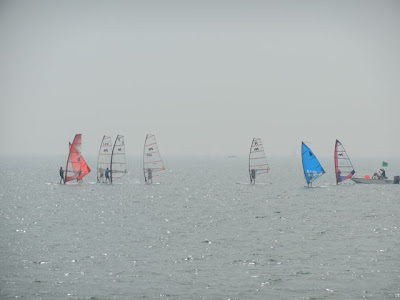 Three long courses were raced - and the sailors were very careful not to fall into the water! There was a light to moderate breeze and the racers demonstrated good gentleman's strategy and tactics as they made their way around course. Click to see Dave Dalquist's photo gallery from this regatta. Jon and Ted setting marks before the race. 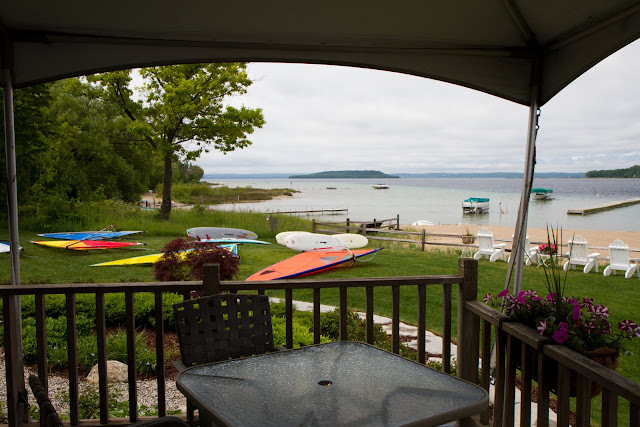 Regatta site in Traverse City. View from Boathouse restaurant. Photo by Dave Dalquist. 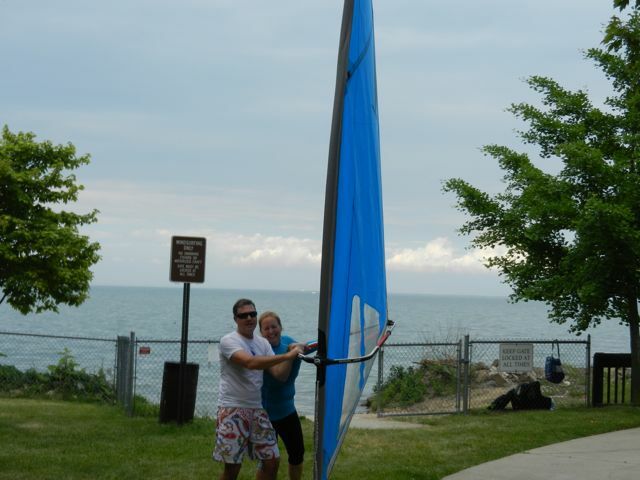 The Grosse Pointe Windsurfing Club hosted this 12th annual regatta at Patterson Park on Saturday June 18th. There was a spectator boat for those who wanted to get an up-close look at the on-the-water strategy. There were 5 races in moderate to light wind. This is a well run event and was well attended with some competitors coming from as far away as Toronto. For regatta report visit MOWIND. 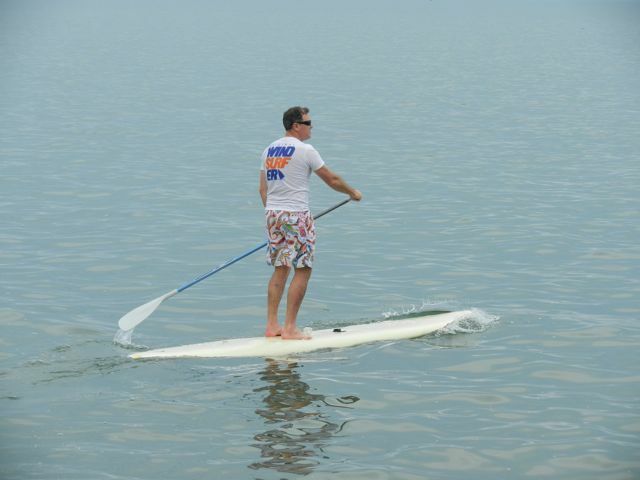 A local sailor named Bruce decided to join me on an Original Windsurfer for the race. There was a nice breeze in the morning. Bruce hadn't been on an Original Windsurfer is many years, if ever. After reading about it's agility and light weight rig he wanted to experience it. 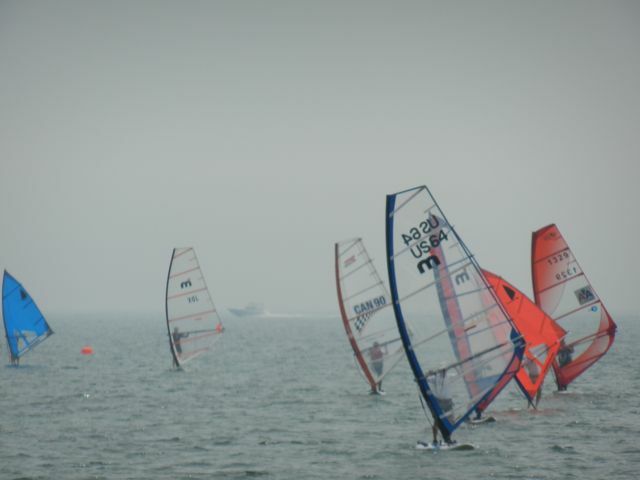 The first race of the day were his first minutes on the board and he had no problems, in fact he sailed it all day! This event has a strong One Design fleet. Nice breeze. The Windsurfer board gliding thru the water. Downwind leg, later in the day the wind lightened up. Battling it out to reach windward mark. The Friday afternoon before the race I met up with a local gal Lauren to go sailing but the wind died on us, so we ended up removing the rigs and going for a SUP instead. Here we are goofing around while there was wind. When we launched the wind died, go figure. 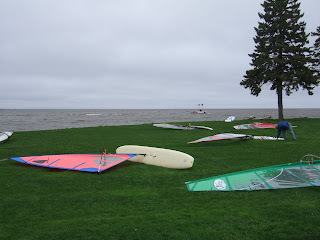 The sign in the back reads, "Windsurfing Only" ! 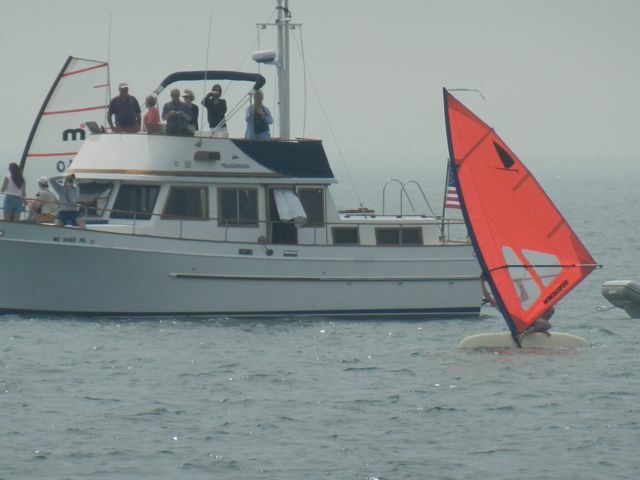 Lauren sailing to shore after wind died to remove sail rig and grab a paddle. 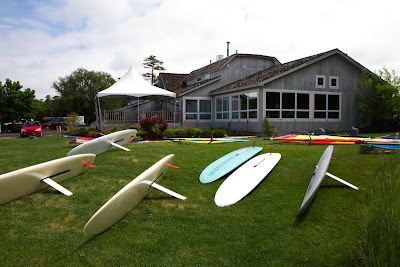 One Design Regattas & More NEW Boards. One of the benefits to owning an Original Windsurfer is being able to rig quickly and sail in any conditions. One board, one sail, anywhere there's wind and water. I recently put this adage to the test at the Walleye Wagatta in Wisconsin where it was b-l-o-w-i-n-g 15 to 20 knots. 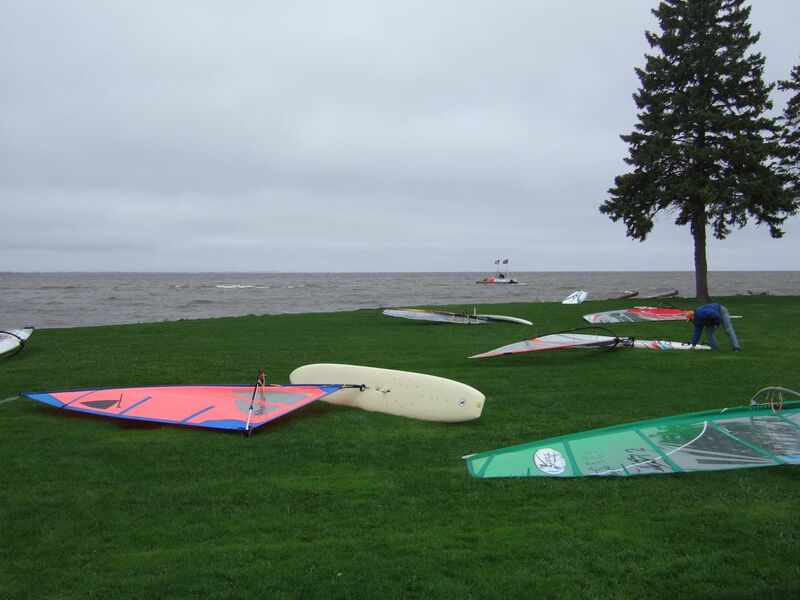 I wasn't sure if I'd get walloped in the high wind conditions...as it turned out I not only had a blast racing the Original Windsurfer in the high winds, but I was also very competitive. The only problem I did have was my bungie-cord uphaul broke. 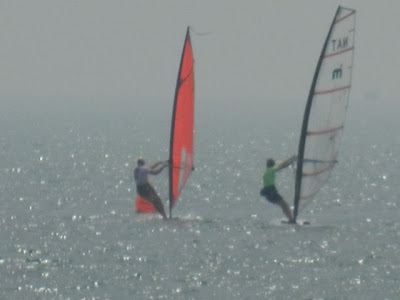 Otherwise the Windsurfer was outstanding, especially around all the jibe marks. I was able to de-power the sail when needed and adjust the centerboard with my foot to maintain stability and balance on the reaches and mark roundings. 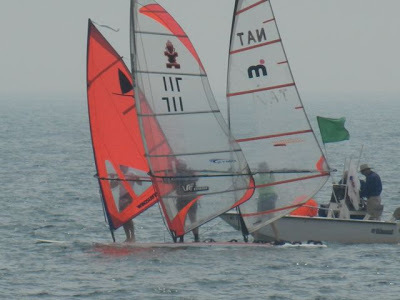 To see a full report of the regatta visit MOWIND. Before the first start of the Walleye Wagatta. The wind continued to build, harnesses required! Original One Design Racing is back! This summer there will be 6 regattas on Original Windsurfer One Design's. 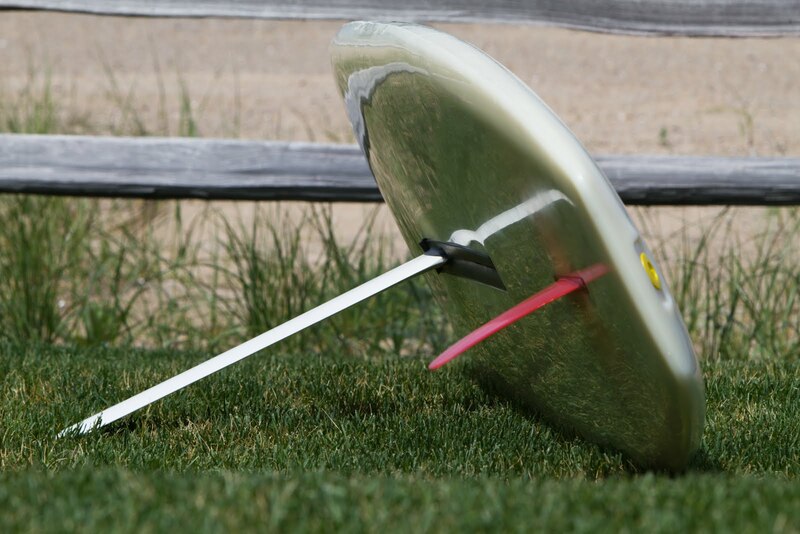 A fleet of Original Windsurfer One Design boards are available so all you need is your swim suit. The regattas will be held in the beautiful resort town of Traverse City, Michigan that has beautiful waters, national parks and any type of outdoor activity you can think of. The regatta includes lunch, regatta t-shirt, races, charter board, bbq after the races, raffle prizes and trophies. 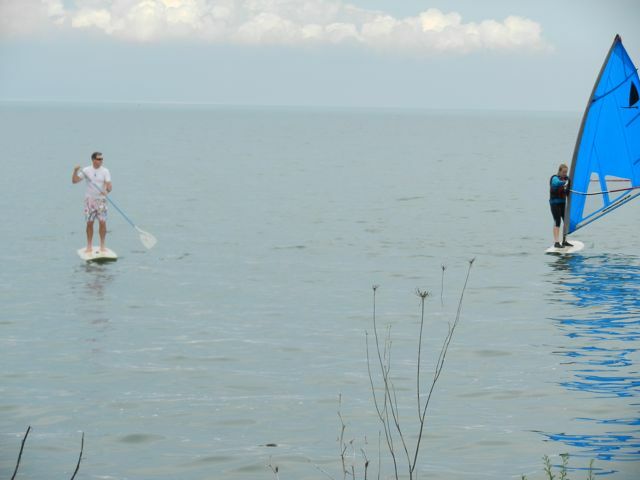 As summer continues to warm up I expect charter boards will be in demand so reserve yours today. If you need assistance with accommodations, have questions or wish to reserve a board contact me. 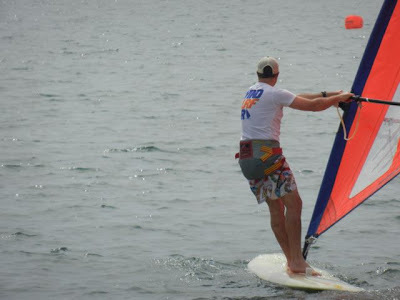 A flyer with more information and details is at Original Windsurfer.com. Traverse City, MI Regatta Site. Sail Colors, which one to choose? Going, going....GONE! 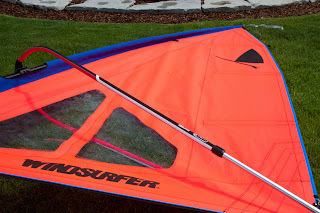 Hard to believe the last new Windsurfer One Design was sold and shipped two weeks ago. But not to worry more are on the way! To find out about pre-ordering a fresh new Original Windsurfer One Design for this summer contact me for details. Choosing the sail color has been the hardest part of the process for the new owners, the sail colors are all colorful and fun. 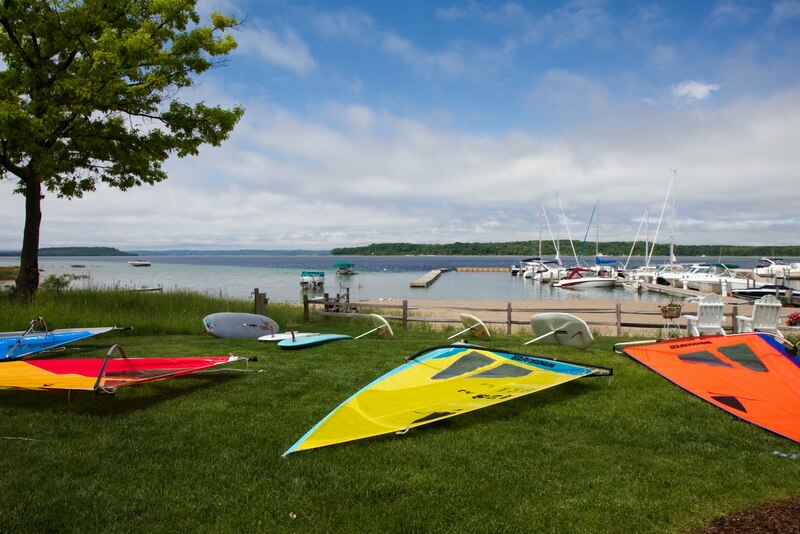 And now here's something to seriously consider...Come to the regatta, have a great time sailing in beautiful Traverse City, make some new friends, sharpen your sailing skills and buy a new Windsurfer. You'll save on the freight cost and we'll help you get her all rigged up to sail in the regatta. Maybe you'll even win some new rack straps to help take her home with you, it could happen. The board's design makes the Windsurfer agile and fun to sail. the Windsurfer sail is light weight and easy to rig.